We stayed here for a few weeks and really enjoyed the park, the people, and the surrounding area. Will stay here again! Great campground for long term or short stays. Showers need a little help. Staff very helpful during registration and directing you to campsite. Campsites on the outer walls get road noise from local traffic. We are repeat visitors to Indian Waters and was disappointed in how we were treated this visit. We booked a 4 night stay over New Year's. Because of heavy traffic we were unable to arrive before the 4 pm cutoff on Saturday. Indian Waters called us on the road reminding us of the office closure at 4 pm and gave us "after hours" instructions. That all worked well but the site we were assigned was in the corner of the park, bordered by 2 streets (one of them very active). When I inquired about the site assignment the next day I was told they didn't know why we were assigned to that site - maybe availability. During our 4 nights there it was very apparent that the park was not full and several sites were available (all 4 nights) that would have been much quieter. Spent several days at this Resort over the Christmas and New Years holidays. Upon arrival we met with the front office staff who were very friendly and provided answers to all of our questions. They invited us to a Christmas pot luck hosted by the Resort. We were given a site that was close to the clubhouse and backing in was easy due to the width and size of the site. The site had all hook ups except cable. 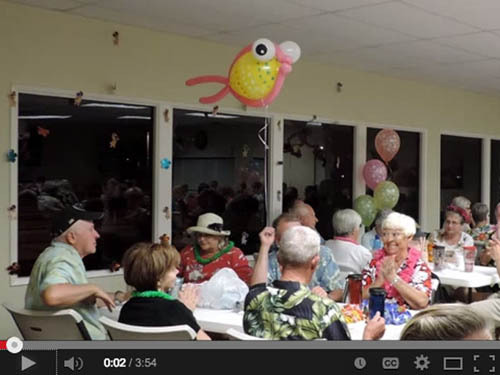 This resort had a large clubhouse, 2 swimming pools, billiard room, pickle ball courts etc. The restrooms were large and private. We were unable to have an outside wood fire due to city code, but propane was acceptable. Overall we were very pleased with stay at this resort and will stay here again in the future. Stayed 3 nights in a 45 ft. motorhome. Long concrete pull-thru with space for toad. Very clean and spacious baths/showers/laundry room. This time of year the place is nearly empty. 25 miles to Palm Springs and lots of activities. 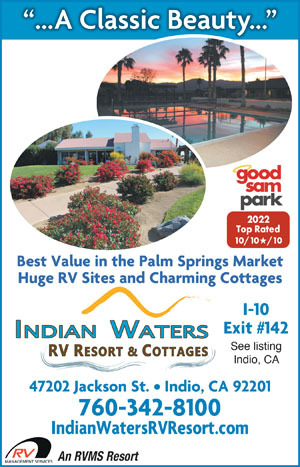 This is an excellent "home base" for day trips to the Coachella Valley area. Although this is a high rated Park, I found it to be only average in every category. 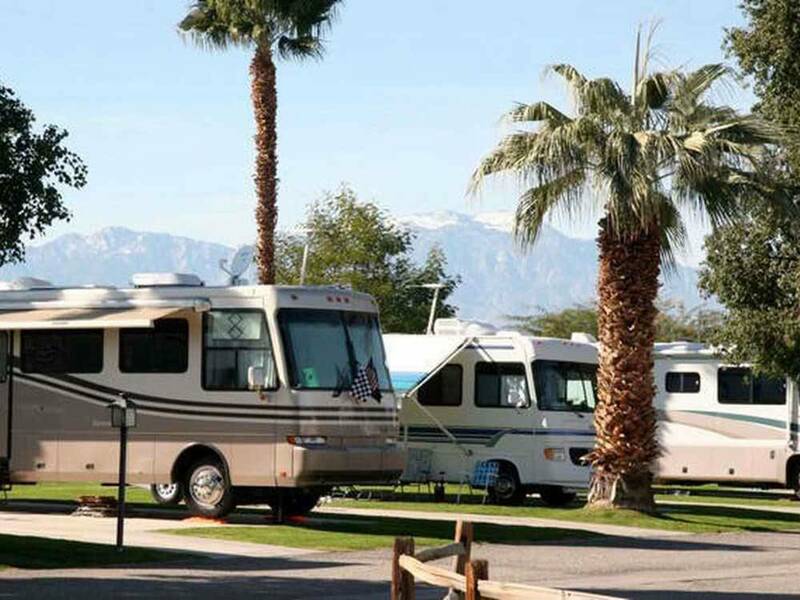 RV'ers should be aware that grass area spaces are watered every night and that the water is extremely hard leaving calcium deposits on all vehicles. It took me over two days to remove these deposits. If you plan on visiting this site, I strongly recommend staying in non grassy spaces. Only there one night but thought it would have been nice to stay a couple more nights. Sites are ample enough for my 33 footer with a living room slide and the campground is neat and clean. Did not use the restrooms so can't review. We had planned to BBQ when we got there but I have cancer and on chemo and the drive from Phoenix just wiped me out. We decided to order delivery and my wife went to the office to inquire about possible delivery options. She was treated very politely and professionally by the office staff who gave her several options. I mention this because this was at the height of the check in time and everyone in the office was busy checking people in. I recommend this park and I will be going back. This place is amazing. About 5 minutes off I-10. Fully paved with lots of gorgeous palm trees and landscaping. They have pull-thru and back-in slots. It's also close to "downtown" Indio and there are a lot of shops, malls and restaurants close by if you want to do something. The office was very helpful even though they are still on summer hours. We had zero complaints and would stay here again if we come this way.